Book of Ra is a casino slot game based on the Egyptian mythology. Book of Ra which is developed by Novomatic, an Austrian gambling company, is the most played slot game of all time. The legendary reputation of the game even exceeds the reputation of the company itself. The game is present in the market in 2100 land based casinos in 46 countries worldwide. The game is played not only at local casinos but online casino under GreenTube brand which is the online service provider of Novomatic. The popularity of the game is also well-known amongst the online gamers. Therefore, having GreenTube games is an essential asset for online casinos to attract online casino players. 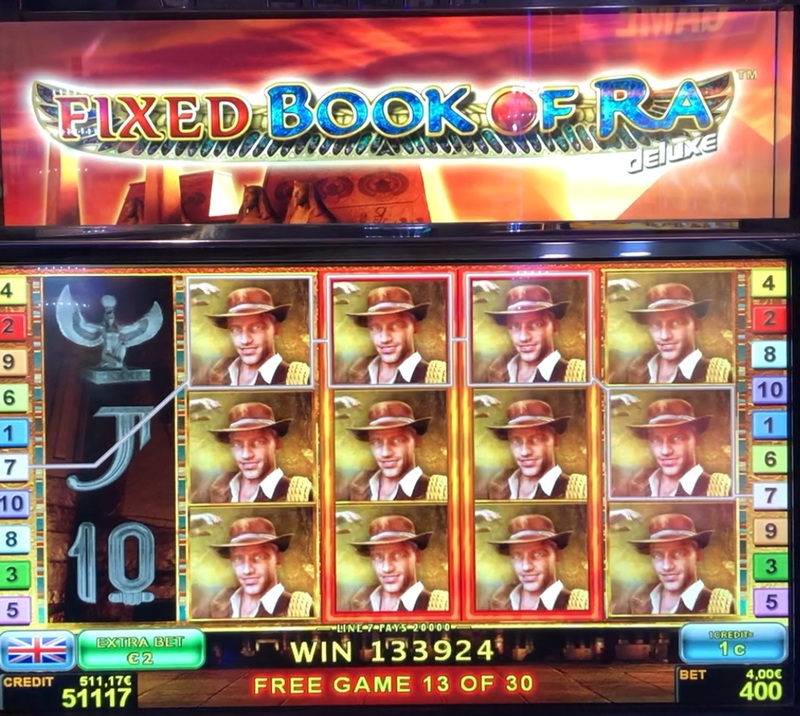 Other online game providers tried to imitate the Book of Ra slot game many times after its big success by name, layout and symbols similarities. Here are some examples of the online slot games inspired by Book of Ra: Gold Of Ra (GameArt), Book Of Dead ( Play’n Go), Riches Of Ra (Netent), Book Of Romeo (Bally Wulff). Even Novomatic developed several games similar. These games have similar layouts and symbols, i.e. hieroglyph, books, to Book of Ra game. However, none of these even come close to the same popularity level with Book of Ra. For this reason, Novomatic changed its strategy and invested in developing this unique game with better versions instead of making similar games from zero. So, the game and the name remained but betting options get richer. The new versions of Book of Ra are Book Of Ra 6, Book Of Ra Two Symbols, Fixed Book Of Ra and Book Of Ra Xpand. When a newer version of the game is introduced, Novomatic makes its debut at local casinos and if they are successful locally, it is distributed to the online casinos via GreenTube. The Fixed Book of Ra is one of the new versions of Book of Ra by Novomatic. The layout of the game consists of 3 rows, 5 columns and 10 pay lines. If you activate the extra bet option in Fixed Book of Ra, Free Spins are enabled with a burning book (joker) symbol. If there are at least 3 Books of Ra on the pay line, you get 10 free spins. Throughout the free spins ride if the burning book symbol places in the second, third or fourth row, the whole column transforms into the character that is selected at the beginning of the free spins. The transformed columns remain “fixed” for all the remaining free spins. That is the reason why the game is called Fixed Book of Ra. If you are lucky to have the burning book symbol in the 2nd, 3rd and 4th reels, the special symbol is guaranteed for the rest of the free spins. However, you get full extra pay line if you find the special character on 1st and 5th columns, as well. Besides, you get extra 10 free spins with the 3 scatter symbol even if you are at the free spin session. If you already opened wild (burning book) symbols, you might get huge wins in the next free spins. As it is mentioned, the only differences between Fixed Book of Ra and standard Book of Ra are extra bet option and the burning book symbol (the fixed book). You can double the bet by choosing the extra bet option in Fixed Book of Ra. Besides, if a burning book symbol lands on the 2nd, 3rd or 4th column, it stays fixed and let you earn more. 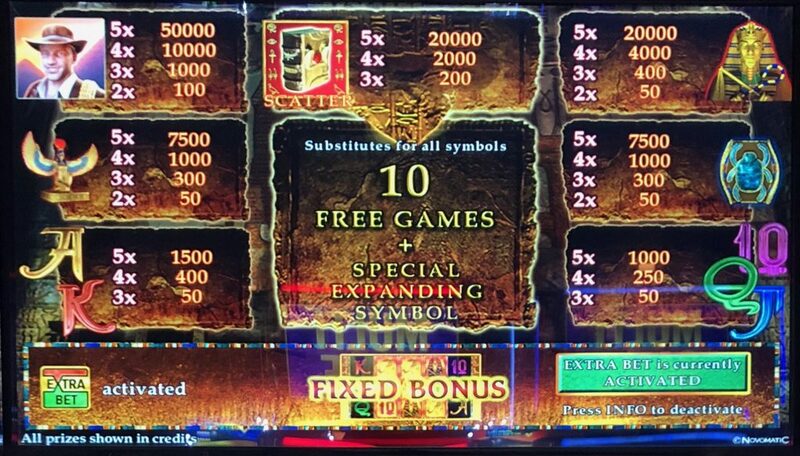 The only advantage of the Fixed Book of Ra is to make the player win more with the special symbols in free spins. If a burning book lands on 2nd,3rd or 4th columns, it gets fixed. This increases your chance tremendously to get special symbols on your pay line. If you also get the special symbol in 1st and 5th you win on full screen. Fixed Book of Ra slot game is only available Novomatic slot machines at the local casinos. Novomatic will make the game available online via GreenTube soon for online casino websites. 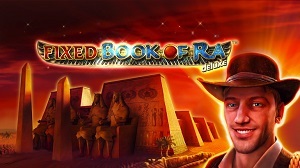 As soon as, the Fixed Book of Ra is available in online casinos, we will announce the good news on our website. The payout rates and the paytable of Fixed Book of Ra are exactly the same with standard Book of Ra Deluxe. However, you pay the double for single bets for the normal spins until free spins arrived due to extra bet option. Therefore, your credit melts down twofold faster than standard Book of Ra for paid games. So, the Book of Ra could be really disadvantageous for the paid games. When free spins start, the game compensates your losses with huge wins via fixed books. 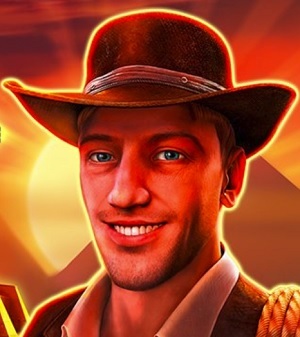 But if you are on an unlucky day which you can’t get any free spin or no fixed books at free spins you lose twice more than standard Book of Ra Deluxe. Fixed Book of Ra is currently unavailable for online casinos. We will announce through our website as soon as GreenTube publishes the online version of Fixed Book of Ra. You can play Book of Ra Deluxe and Book of Ra 6 versions in online casino websites with GreenTube. Besides, Book of Dead by Play’n Go is a very popular game with same game characteristics such as free spins with Book of Ra. Copyright © 2019 Fixed Book Of Ra, All Rights Reserved | Sports Betting Affiliate Theme from Flytonic.